Tetbury has long had royal connections and this charming Elizabethan market town, set among gently rolling hills, certainly possesses an aura of wealth and class. Highgrove, home to Prince Charles, is in the immediate vicinity. Gatcombe Park, Princess Anne's country residence, is just three miles to the north. International polo tournaments take place regularly at nearby Westonbirt and a few miles to the south lies Badminton, home to the famous horse trials. The Beaufort Hunt is local to Tetbury and in previous centuries vast hunt balls were held in the aptly-named Snooty Fox Hotel in the centre of the town. 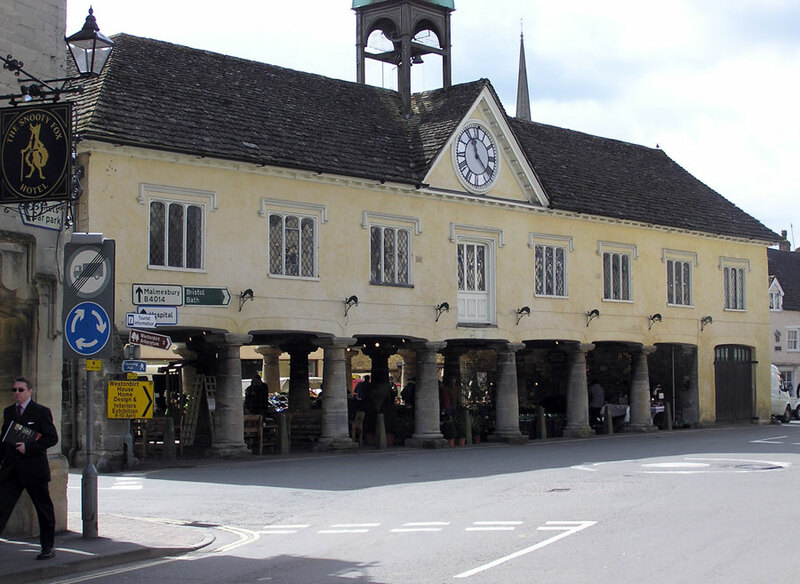 Tetbury was designated a conservation area in 1971 and the town is renowned for its high-quality antique shops, almost all of which are clustered together in the grand buildings of Long Street. Although most of the town's fine buildings were financed by the wool trade and date from the 16th and 17th centuries, Tetbury's rambling street plan is clearly Medieval. The town is thought to have been built on the site of an ancient hill fort, which was superseded by an Anglo-Saxon monastery. The monastery was founded in the seventh century by King Ine of Wessex and the first record of a settlement, called Tette's Minster, is dated 681. Tette is thought to have been Ine's sister, who went on to become the abbess of a famous double monastery open to both monks and nuns at Wimborne. The town's name could, however, just as easily have been derived from the Celtic 'Tedd' (Open Space) and Anglo-Saxon 'Bury' (Fortress). Tetbury was insignificant enough to remain largely untroubled by the historical battles that ravaged neighbouring towns such as Bath and Cirencester, although its position on a major east-west trade (drover's) trail allowed it to prosper as a market town during the peak of the Cotswold wool trade. The centre of the town is still dominated by the Market House which was built in 1655 and enlarged in 1740 to accommodate a fire engine. The distinctive stone pillared semi-outdoor spaces are still used as a meeting and market place today. The original market place, also known as the 'Chipping', is now a car park. The car park gives way to a steep Medieval Street known as Chipping Steps which end at what is known as Horsepool Bottom. Here fraudulent traders were ducked on a ducking stool, sometimes called a 'Gumstool', after the slang 'gummy' which probably meant something like 'mouthy.' The gumstool gave its name to Gumstool Hill, an important part of Tetbury's popular culture to this day. Each year on Whitsun Bank Holiday the hill is the scene of the annual Tetbury Woolsack Races, founded during the Middle Ages. Brave competitors are required to carry a 60lb sack of wool all the way to the top of this razor steep incline. Near Horsepool Bottoms is The Church of St Mary, which was designed and built by Francis Hiorn of Worcester. This 18th century piece of Gothic Revival was built on the site of an old Medieval Church, the remains of which can be seen in the unusual passageways that run between the outside wall and the wall of the nave. If antiques and old buildings are not your thing then head to the Tetbury Police Museum. Housed in the original cells of the old police station, the museum contains a fascinating collection of uniforms and memorabilia relating to the Gloucestershire Constabulary. A number of pubs and bars cater for the bus-loads of visitors that spill regularly onto Tetbury's streets, but the one with the best story has to be the award-winning Trouble House. Between 1959 and 1964 this pub was served by the Trouble House Halt, which makes it the only pub in England ever to have had a railway station built expressly for the use of its customers. For those of you who enjoy a stately home, Chavenage House just two miles north-west of the town is, unlike Highgrove, open to the public. This E-shaped mansion, built in Elizabethan times on the foundations of a monastery, remains largely unchanged. Oliver Cromwell was a guest here during the Civil War and it is said that he personally persuaded the owner, Colonel Nathaniel Stephens, to vote for the king's impeachment. The present owners (Lowsley-Williams family) can trace their lineage back to the original owners and the house (guided tours are available) contains many relics from Cromwell's period together with a room full of rare tapestries from the 17th century. In 1970 a portfolio of watercolours done by King George IV of plans for the restoration of Windsor Castle was found in the attic. The owner describes his family seat as the second most haunted house in Gloucestershire after Berkeley Castle. The legend of Chavenage says that one previous owner who died as a result of a curse from his own daughter was taken from the house in a black coach driven by a headless horseman.